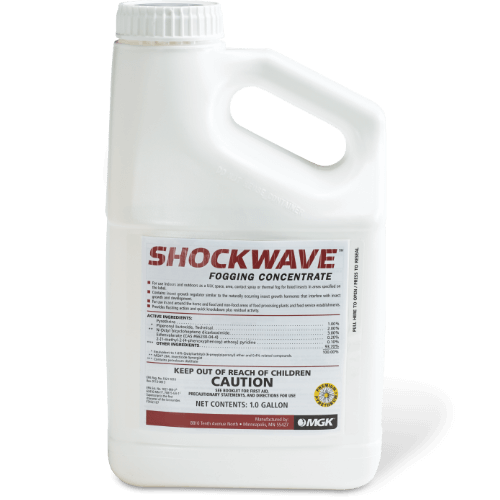 Shockwave Fogging Concentrate combines five active ingredients, including NyGuard IGR, to provide flushing, fast knockdown and residual control of a broad spectrum of commercial and resident pests, including cockroaches, stored product pests, flies, spiders, ants, fleas and ticks. Reference the product label for the full list of pests killed or controlled. Shockwave is dual synergized for enhanced control. The combination of the five active ingredients makes it ideal for cleanouts and tough situations with hard-to-kill pests. What package sizes are available for Shockwave?